Carlos Galindo (Damien Bichir) is a single parent and hardworking gardener in East LA who worries for his son's future. It seems accepted by everyone that Luis Galindo (Jose Julian) will eventually become ensnared by the local gang - a prospect that Carlos is desperate to avoid. He wants a better life for his son and is willing to risk his own safety (he is living in America illegally) to ensure that Luis has the opportunities that were never available to him. I have reached a milestone of sorts. This is my 50th film review. I can hardly believe it - only 450 to go!! So, with this in mind, I am so pleased to be reviewing A Better Life today. I absolutely love this film. A Better Life is about a father and a son. Carlos works every hour of the day in order to provide for Luis. However, his work ethic only drives them further and further apart. Luis is angry and confused. He has little respect for his father and sees no future for himself. As a result, he seeks status by hanging out with a local gang. Steps away from becoming a member, he starts to wonder if this is the path he wants to tread. But, what are the other options? Carlos believes the future lies in the development of a gardening business. When his employer offers to sell him his truck, Carlos borrows the money. He thinks that this is his only chance to make enough money to move his son to a better school. However, when an act of kindness backfires, Carlos looks set to loose everything. Driven by the injustice of the situation, Luis joins Carlos in a tense and thrilling journey. Beautifully portrayed - the terrible events force father and son to reassess their relationship and the possibility of a better life together. 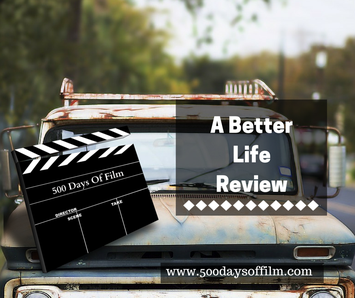 A Better Life has a perfect blend of character development and thrilling plot. It is so tense at times I was literally on the edge of my seat. Demian Bichir is superb as Carlos. It is amazing how he can portray so many complex emotions in such a still and understated manner. He was nominated for an Oscar in 2012 for this performance (losing to Jean Dujardin for his performance in The Artist).